There is no other place in the world like Italy: the sun and the sea salt, the scent of the citrus and coffee, a seductive gaze, an incomparable song rising from the heart. 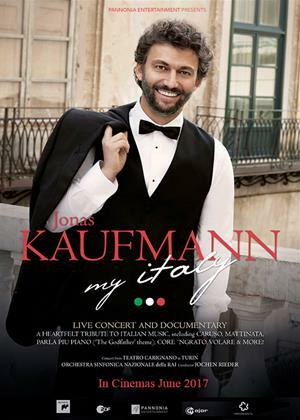 Anca Monica Pandelea’s film documents Kaufmann’s special affinity with the Italian language, the Italian way of life and culture - and also, of course, the music. Jonas presents his personal tribute to a culture where the influence and beauty of Opera goes beyond the walls of the theatre. Puccini and Verdi are not the central figures of the concert however, but the hits from tenors like Enrico Caruso and Lucio Dalla. The concert was recorded in Teatro Carignano in Turin, the Orchestra Sinfonica Nazionalle della RAI accompanies the star under the baton of Jochen Rieder. Kaufmann sings popular songs like “Torna a Surriento”, “Cor’ngrato”, “ Mattinata”, “Parla pie piano”, “Caruso” and “Il canto”.